Update 11/7/2018 Harley is home and doing well. Update: Harley is scheduled for surgery November 1st thank you to all that donated. Thank you to the Glen Burnie Civitans for their generous donation that made this possible. 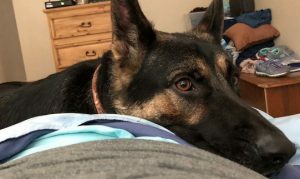 Harley is s 2 year 6 month old full blood German Shepard. Harley was bought to be a Service Dog for me. I am disabled and only receive my Social Security Disability. Harley had been through the puppy basic obedience training and the advanced puppy training and did very well. When Harley was about a year old he fell from the couch onto his tail. I thought he broke his tail. I took him to the Vet they performed an X-ray and exam. The results were that it was not broken but since then Harley chases his tail, biting at the tip of his tail to the point that it bleeds. He then spins sending the blood everywhere. My walls look horrible. Blood is all over the lower half of my walls and doors. It is almost like he has nerve damage. The weather seems to make it worse. He whines and bites at the tip of his tail. Currently they have him on Trazodone and Tramadol just to give him some relief. The medicine only works a little. At times it seems to not even help anymore. Harley is needing some type of permanent relief. After talking to several Vets it has been decided to have Harley’s tail amputated. I have researched and prayed about this and at this point I just want Harley to get some relief from the pain. I am on a fixed income and thus I am requesting help in paying for Harley’s surgery to help him be out of pain. Any help would be greatly appreciated. Thank you in advanced.